Chief Election Commissioner N.Gopalaswami today directed the administration to make contingency arrangements for smooth conduct of polling in the eventuality of more snow. Gopalaswami, who was here along with other members of the Election Commission to review arrangements for the second phase of polling on December 19. It was a day of rejuvenation for the BJP cadre across Sirmaur, with its chief ministerial candidate Prem Kumar Dhumal giving a clarion call for ousting the Congress from the state. 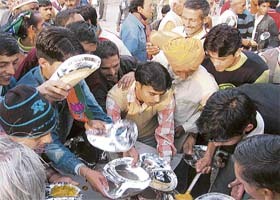 A scramble for free food after a BJP rally addressed by Prem Kumar Dhumal in Tirlokpura, near Kala Amb, on Thursday. Punjab Chief Minister Parkash Singh Badal, who addressed an election rally at Baruna in favour of BJP’s H.N. Saini today, announced that his government would take up construction of the Baddi-Chandigarh road on priority. Snowfall dampens HP’s election campaign. The Bamsan assembly constituency where Prem Kumar Dhumal, chief ministerial candidate of the BJP, is contesting for the third time in a row, is being challenged by Col. B.C. Lagwal (retd) of the Congress. BJP leader P.K.Dhumal could not reach Shahpur and Gurkhari near here owing to bad weather. It rained in the Kangra valley for the entire day while the Dhauladhar ranges experienced snow on the second day today. Chief Minister Virbhadra Singh said today that the BJP was raising the bogey of regionalism to divide the state on regional lines. Addressing a public meeting at Adbullahpur, the native village of BJP candidate Vidya Sagar, this afternoon, he lambasted the BJP leadership for nurturing regionalism. “Dream Girl” of Bollywood and BJP MP Hema Malini today stormed the fort of Chief Minister Virbhadra Singh here in Shimla district and assailed the ruling Congress for failing on all fronts. The Congress today received a boost with former MP and three-time MLA Ranjit Singh joining the party. He remained MLA from Kutlehar from 1967 to 1972 as an Independent, from 1980 to 1985 as the Himachal Lok Raj Party MLA and represented the Janata Dal from 1990 to 1993. The simian menace on roads and highways on the inter-state border has not only been adversely forcing scores of monkey-families to lose their basic instinct for food hunting but has also become a major election issue in the area. Even as the election commission has enforced the norm of prominently displaying the candidate’s name on the windscreen along with a copy of the permit, the norm appears to be observed more in breach. The normal life in higher hill areas of the state remained affected as snow and rain continued to lash the region for the fourth consecutive day today. Continuing snowfall and rain, coupled with extreme cold conditions, have virtually grounded the poll campaign in most parts of the state. The entire North India, including the national capital, is in for an acute power shortage following 80 per cent drop in electricity generation at the Nathpa-Jhakri hydel power plant in the state. Ravi Dutt, the main accused allegedly involved in the case of embezzlement and misappropriation of funds at Kangra Central Cooperative Bank, Bhuntar, was arrested on Tuesday and produced for police remand at the CJM court here yesterday. After seeing her sixth generation Sevati Devi of Mugnial village in the Minjgrah gram panchayat of this subdivision died yesterday after touching the age of 117 years. Born in 1890 Sevati had been confined to bed infected by many old-age problems like poor vision and hearing for over one year. Chief Election Commissioner N.Gopalaswami today directed the administration to make contingency arrangements for smooth conduct of polling in the eventuality of more snow. Gopalaswami, who was here along with other members of the Election Commission to review arrangements for the second phase of polling on December 19, held a series of meetings with representative of political parties, deputy commissioners, SPs and others involved in the conduct of the elections. He said 576 out of the total 5942 polling booths were likely to affected by snow, the maximum 245 booths in Shimla district, 89 in Sirmaur, eight in Kangra, 83 in Chamba, 28 in Kulu and 123 in Mandi. The administration had been asked to keep men and machinery ready for prompt clearance of snow. However, in some polling stations use of helicopter would be required for which necessary arrangements would be made. He maintained that the cancellation of rallies of various national leaders due to inclement weather would not make any material impact on the elections. Campaigning was carried out at various levels in which a large number of political workers were involved and the leaders only summed up the issues. He defended his decision to conduct the elections during December and said he would have been more correct if the second phase was advanced and the entire process completed by the end of November. The CEC directed the deputy commissioner to keep a close watch on the PWD and Health Department staff as the political parties feared that they would not act impartially as the head of these two departments had been obliged with an extension in service. The BJP had submitted a complaint in this regard. The commission had taken notice of the news report published in The Tribune and decided to set up an auxiliary polling station at Kuthera in Pong Dam under the Jwali constituency. Another auxiliary polling booth was being set up in Bara Bhangal under the Baijnath segment. The commission had also taken a serious notice of bogus votes made in the Jubbal Kotkhai segment where underage boys had been enrolled as voters. It was a day of rejuvenation for the BJP cadre across Sirmaur, with its chief ministerial candidate Prem Kumar Dhumal giving a clarion call for ousting the Congress from the state. Supporting him was Punjab Chief Minister Parkash Singh Badal, who gave a similar call from Paonta Sahib, where the two today addressed an election rally. Thanks to the two airborne leaders, who addressed at least six rallies in the remotest corners of the district, largely sleepy Sirmaur came alive with hectic political activity. The two spiced up the scene for the contesting BJP candidates in Paonta Doon, Rainka, Shillai and Nahan, with Badal charming the voters in his trademark “unassuming” style. The Nahan rally at Tirlokpura by BJP’s chief ministerial candidate Prem Kumar Dhumal was the toast of the day. Standing tall on a makeshift stage with the famous temple of Mata Balasundari in the backdrop, Dhumal dared Congress Chief Minister Virbhadra Singh to “retire with dignity and leave Himachal Pradesh for the BJP to handle”. Even after 16 years as Chief Minister, Virbhadra did not watch the interests of the state or its people, he said. As Dhumal launched one tirade after the other against the Congress, his supporters cheered him as their leader’s vitriolic attacks on the ruling party marked by price rise, unemployment and corruption, came as a boost to their confidence. “Give me these five days of your lives and I will serve you for the next five years,” said Dhumal, playing to emotions, even as Shyama Sharma, BJP’s candidate from Nahan, showered petals on him. Interestingly, there were many women in the gathering, and they were happy to be around as Dhumal declared: “The BJP will offer 50 per cent reservation to women candidates in all civic body and other polls. Last time, we had declared a holiday on Karva Chauth. But this time we promise holidays and free bus rides to sisters on Raksha Bandhan and Bhaiya Dooj”. Dhumal said the BJP would protect the interests of all government employees who had in the past suffered at Congress hands. “Unjustified transfers will be rolled back. Implementation of the Town and Country Planning Act will be done on a case-to-case basis and farmers’ interests will be guarded,” Dhumal said, as he went on his voter-enticing spree to another destination, leaving the voters at Tirlokpura scrambling for food. Punjab Chief Minister Parkash Singh Badal, who addressed an election rally at Baruna in favour of BJP’s H.N. Saini today, announced that his government would take up construction of the Baddi-Chandigarh road on priority. Criticising the Congress government for allegedly ignoring the road link, he said the road would be among the first development activities to be pursued by their government to benefit investors in the industrial belt. He said the Congress governments in the neighbouring states had failed to address this key issue. The industrial package announced by former Prime Minister A.B. Vajpayee had failed to benefit Himachalis as the infrastructure, including road network, was in pitiable shape, he said. Striking a chord with transporters, who had been facing problems while plying vehicles between Himachal and Punjab, Badal said their problems would be dealt with in an effective manner. Addressing the rally in chaste Punjabi, he time and again dwelt on the fact that all promises made in the manifesto would be fulfilled. He flayed the Congress government for not having fulfilled its poll promises made during the previous elections. Badal’s arrival to the venue was delayed by two hours due to bad weather. Earlier, he addressed a rally at Paonta Sahib in Sirmaur district. BJP’s major rally, which was to be addressed by P.K. Dhumal, at Kandaghat could not take place due to bad weather. Dhumal who was scheduled to arrive in a chopper after addressing election rallies in various parts of Sirmaur district, failed to reach the venue. After waiting for several hours, the rally was called off. The Bamsan assembly constituency where Prem Kumar Dhumal, chief ministerial candidate of the BJP, is contesting for the third time in a row, is being challenged by Col. B.C. Lagwal (retd) of the Congress. Two other candidates, Surinder Kumar (BSP) and Raj Kumar (LJP), are also in the fray. While the Chief Minister’s tag is the most important factor in this constituency the Congress candidate, who has entered the fray for the first time, is hoping to beat Dhumal with the support of army personnel and their families that have 30,000 votes in this constituency along with committed Congress voters. Prem Kumar Dhumal, who has all along been winning this seat with huge margins, is so confident that he has not campaigned in this constituency even once so far. Dhumal’s campaign is being run by his son, Arun Dhumal, state BJP vice-president Raseel Singh Mankotia and mandal BJP president Desh Raj Sharma. Dhumal’s campaign managers say “the people of Bamsan have passed a resolution urging Dhumal to devote more time for campaigning in the state since there is no need for campaign here”. The Congress, which has fielded Col B.C. Lagwal (retd), a new candidate replacing Kuldeep Pathania this time, is trying to take full credit for the Rs 75-crore Bamsan- Mewa drinking water schemes that would provide drinking water to 214 villages in the area. Though Lagwal is putting a brave face the huge margins with which Dhumal has been winning must be a cause of worry for him .A total of 69239 voters would cast their votes this time. Dhumal was to fly from Sirmaur by helicopter and was scheduled to land at Gaggal airport and address BJP meetings at Shahpur in support of Sarween Choudhary and at Gurkhari in support of Vidya Sagar but inclement weather played the spoilsport. Mr. Vidya Sagar said that even the venue of landing of helicopter was changed from Gaggal to Sapri near jawalamukhi but it did not materialize and his visit was finally cancelled. Chief Minister Virbhadra Singh said today that the BJP was raising the bogey of regionalism to divide the state on regional lines. Addressing a public meeting at Adbullahpur, the native village of BJP candidate Vidya Sagar, this afternoon, he lambasted the BJP leadership for nurturing regionalism, adding that had the Congress done so Himachal Pradesh would have not been a full-fledged state. He asked BJP candidate and OBC leader Vidya Sagar as to why OBC people were lathi charged during the Mandal Commission struggle and why the Army was called out and curfew imposed during BJP rule when he was a minister? He said his government was committed to providing 27 per cent reservation to OBCs in accordance with the Mandal Commission report but was waiting for court directions in this regard. Mixing filmi dialogues with hard political talks, the noted actress appealed to the people to support the BJP. Although she reached the rally venue almost five hours late due to inclement weather, people stayed to have a glimpse of Hema Malini. Such a big crowd at Rampur, which is part of the CM's princely Bushehar state, is not good news for the Congress, which has fielded Nand Lal, a former SPG commando who provided security to Congress president Sonia Gandhi. Seeking votes for BJP nominee Brij Lal, Hema Malini castigated the Congress for doing precious little developmental work in the state during the past five years. None of the promises made by the Congress in the last elections was fulfilled, she said and referred to the growing unemployment problem among the educated youth in the state. He was elected to the Lok Sabha from Hamirpur in 1977 as the Janata Party candidate. The monkey menace has aggravated to such an extant that a sections of residents, especially farmers, of Nurpur, Gangath, Guler, Jwali and Jaswan constituencies have decided to support only those contesting candidates, who would come to their rescue on this issue. A survey by a Tribune team to these constituencies revealed that the problem had genuinely hit the small-time farmers adversely. Since agriculture was the main profession of a majority of the residents of this area so damages caused by the monkeys, wild-bores and other stray cattle had forced the farmers to raise this issue for the assembly elections. Ajay Pathania, an advocate from Nurpur, claimed that youngsters of the area had decided to support only those candidates, who would promise to solve the problem. The monkey menace has created an atmosphere of panic among the residents as their families have multiplies manifold in the past couple of years. The villagers have to burst crackers and pass sleepless nights to save their crops from simians, he claims. Leaving his 10-year of service as a divisional forest officer (DFO) in the state government, Ashok Somal, an independent candidate from Jwali, has been contesting the election with “solution to the menace” as the main issue. He said tackling monkey and stray animals menace would be his top priority if he won the elections. A survey of the Arki constituency by The Tribune revealed that a majority of the vehicles used by political parties rarely carried the names of the candidates or else they were too small to be clearly visible. While the commission had clearly specified a particular size, there is little adherence to it. The liaison officer of the election observer R.P. Chauhan, however, said any vehicle being so used in an election area is assumed to be used for campaigning and hence it requires a permit to even put a flag on it. The Congress men, however, questioned as to how the move was justified as the vehicle was not a part of any election cavalcade. It was on way to Punjab, they said. With the commission maintaining a strict watch on poll expenditure and specifying that no banners or posters be pasted on government buildings or on private ones without the permission of the owner, barely a few posters were found in even the key towns of Arki. Banners were mostly visible only outside party offices or outside shops of party workers of various parties. The high court today issued notice to the Election Commission of India on a petition filed by the PCC against the order of the returning officer of the Gangath constituency rejecting nomination papers of Congress candidate Bodh Raj. The court directed the returning officer to file his reply before December 17. The Congress has said that nomination papers were cancelled without giving any notice or opportunity of hearing. The hill ranges with an altitude in excess of 7,500 ft in Shimla, Sirmaur, Kullu, Mandi, Kangra and Chamba have been witnessing intermittent snowfall since wee hours. Narkanda and Khara Pathar received 20 cm fresh snow today, taking the total during the current spell to 80 cm. The Hatu Peak was buried under 100 cm of snow. Snow clearance work was on at Narkanda and Khara Pathar for which the PWD had deployed requisite machinery. However, very few vehicles ventured to pass through the highway due to slippery conditions. Churdhar, Dhauladhar and Shikari Devi ranges experienced moderate to heavy snowfall over the past 24 hours. The entire region was shivering under extreme cold with mercury hovering 10°C below the freezing point in tribal areas. Paseio in Lahaul-Spiti recorded the lowest temperature of -15°C, while Keylong was slightly better at -7.7°C. Dhundi, Solang Nullah and several other places were also reeling under sub-zero temperatures. The city and surrounding areas were lashed by intermittent sleet and rain accompanied with icy winds. It was slightly warmer compared to yesterday with the minimum temperature rising to 1.6°C. The lower areas of the state had widespread rain, which is being termed as good for the rabi crop. The meteorological office has predicted more rain and snow over the next 24 hours. The 1,500-MW plant on the Sutlej has seen water flow dwindle due to freezing temperatures in the higher reaches of the Himalayas, sources in the NJHPC said today. Against a requirement of 400 cumecs of water to run all six units, only 75-80 cumecs of water was available these days, causing power generation to dip by 28 million units. Only one or two units are running due to the water shortage, source said. However, this is a normal feature in the winter months. The problem persists from December to mid March when the upper areas of Kinnaur and Tibet receive heavy snowfall that freezes most of the natural water sources. Ravi Dutt, the main accused allegedly involved in the case of embezzlement and misappropriation of funds at Kangra Central Cooperative Bank, Bhuntar, was arrested on Tuesday and produced for police remand at the CJM court here yesterday. The other four, Kehar Singh, Tilak Raj, cashier Inder Singh and Khema Ram, a tailor of Nagwain, were already in custody in the Rs 34.54 lakh fraud case. ASP Hardesh Bisht said Ravi Dutt, a clerk in the bank branch, had been evading arrest and trying to get anticipatory bail from the Himachal High court. Bisht said interrogation revealed that Ravi Dutt was allegedly involved in manipulating funds of the bank. SP G.D. Bhargava said here that the case was registered on a complaint from the zonal manager of the bank. Most of the money had been recovered from the accused. After seeing her sixth generation Sevati Devi of Mugnial village in the Minjgrah gram panchayat of this subdivision died yesterday after touching the age of 117 years. Born in 1890 Sevati had been confined to bed infected by many old-age problems like poor vision and hearing for over one year. She belonged to a scheduled tribe ‘Gaddi’community. Until one year ago she used to cook food, clean the house and move with the help of a stick.